There are many easy Jamaican Food Recipes just waiting for you to try them out. 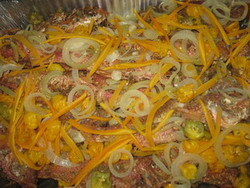 This page will teach you how to make a traditional Jamaican favourite, Escoveitched Fish. At the end of the page there are links taking you to other great Jamaican recipes, like Festival, and Johnny cakes. I used to think "escoveitch" was a strange word (sounds German), given that the dish has Spanish roots. It was introduced into Jamaica in the 16th century, during the time of Spanish settlement of the island. What I didn't know was that the original Spanish word was "escabeche", meaning pickled. The English anglicised it, and we have further Jamaicanised it to "scobeech". In a time when no one had electricity, it was a dish that could be prepared beforehand and left for a day or more without spoiling. Just about any type of fish can be used - it's fried and then covered with a spicy escoveitch sauce which preserves it. We'll eat it for breakfast, lunch or dinner. Fish is especially popular during Lent, and on Good Friday in particular. Beware, this dish is spicy! Make diagonal slashes in fish. Mix together the salt, black pepper and crushed pimento. Place a little of this mixture inside each slash. Dust the fish with the seasoned flour, and deep fry in hot oil until golden brown. Set aside. Place all the ingredients for the escoveitch sauce in a pot, and bring to a boil. Boil for about half a minute. Don't boil too long or vegetables will lose their crunch. Pour the sauce over the fish. There is no need to refrigerate if the fish is going to be eaten by the next day. Very convenient if your fridge is full! Eat with bammy, festival, Johnny cakes or bread.